Each morning I scan the dailies for sad stories of local pedestrian, bike and transit deaths to adapt for “Fatality Tracker” posts on my transportation blog, Grid Chicago, in order to raise awareness of the need for safer streets. And almost every time I look at the papers I also see tragic news about the latest murders, averaging more than one killing per day. This year the Chicago Department of Transportation (CDOT) put out two planning documents with the stated goal of eliminating all traffic deaths and crashes within the next ten years. I applaud this bold approach, and I can’t help but wonder out loud if “Zero in Ten” could be successfully applied to our city’s homicide epidemic as well. Released in May, the Chicago Forward Action Agenda is a roadmap for creating a safer, more efficient and more sustainable transportation network for people traveling on foot, bicyclists, transit riders and motorists. The Chicago Pedestrian plan, published in September, lays out more specifics on improving conditions for walking. According to stats my Grid Chicago blogging partner Steven Vance compiled from Illinois Department of Transportation (IDOT) data, last year 117 people died in crashes while walking, biking or driving within the city. As of last Saturday there have been 111 pedestrian, bike and motorist deaths here in 2012, so we’re on track for a total of 133 casualties this year. IDOT blames the increase on the mild winter and warm spring, which led to more driving. To achieve the safety goal, Chicago Forward lists dozens of different action items under the categories of evaluation, engineering, enforcement and education. These include studying the ten worst intersections for crashes in the city each year, as well as analyzing all fatal crashes involving pedestrians and bicyclists, and implementing short- and long-term improvements to these locations to prevent future collisions. Meanwhile, the pedestrian plan features many “Tools for Safer Streets,” infrastructure like countdown walk signals, leading pedestrian interval stoplights, pedestrian refuge islands and “Stop for Pedestrians” signs. Other strategies include road diets, which remove extra car lanes to make room for wider sidewalks and bike lanes, plus traffic-calming elements like chicanes, speed humps and traffic circles. This philosophy also should be applied to the murder rate, which is arguably a more pressing problem. Compared to the 117 traffic deaths in 2011, there were 435 murders in Chicago that year, according to the police department. On Monday morning the city passed that grim landmark with 436 killings so far this year, and if we continue at the same rate we’ll end 2012 with 523 murders, the highest death toll since 2003. The increase has also been blamed on the weather, as well as gangs splintering into smaller factions after their leaders have been jailed, creating more opportunities for conflict. While the police have the responsibility for dealing with the aftermath of violence, it’s not their role to address the underlying social causes. These include Chicago’s legacy of segregation, which combined with inequities in education and job discrimination create vast sections of the city with widespread poverty. In these areas, odds are far higher that kids will be born into single-parent homes and affected by alcohol and drug addiction, child abuse and neglect. These conditions make it much more likely that youth will eventually get involved with gangs and guns. Traditionally the approach to combating homicides has been through the criminal justice system, with a focus on arresting and jailing the perpetrators. 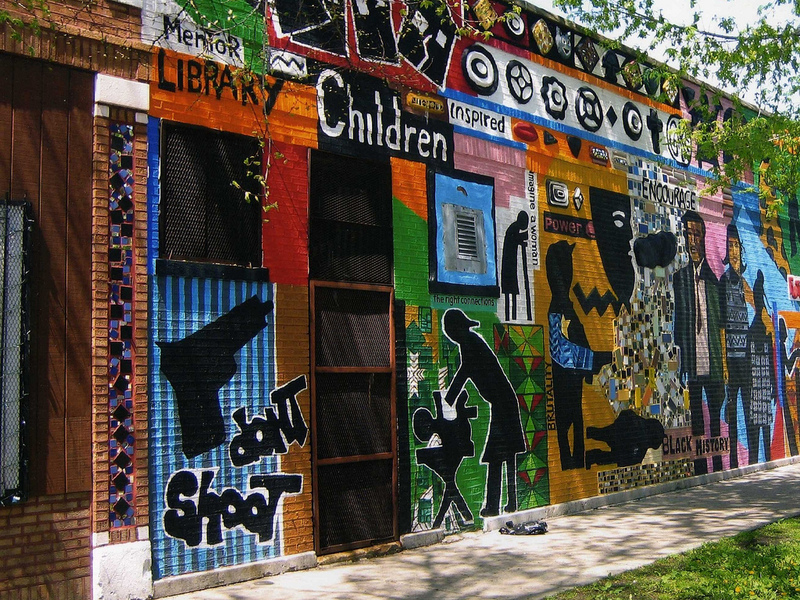 The Cure Violence initiative, formerly Ceasefire, uses a radically different method, documented in the 2011 film, “The Interrupters.” Founded here in 2000 by epidemiologist Dr. Gary Slutkin, the program takes a public health approach to violence, treating it as an illness whose spread can be stopped through disease prevention strategies. Outreach workers called violence interrupters, often reformed gang members themselves, patrol the streets to mediate conflicts and prevent revenge shootings. There’s strong evidence this approach helped reduce the murder rate in several Chicago neighborhoods. “We’re able to get in there, intercept whispers and talk to the people involved,” explained Cure Violence director Tio Hardiman in a Time Out Chicago interview this summer. “You’re not going to stop this [violence] by parachuting in. You’ve got to have boots on the ground to prevent someone from shooting. 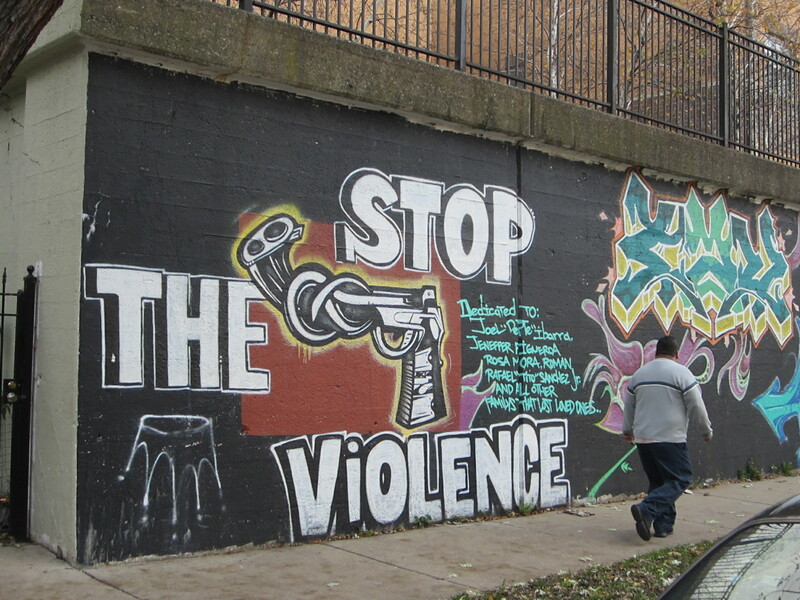 If we can keep a guy from going to the penitentiary or the cemetery, that’s our role.” In July the city announced a one-million-dollar-a-year contract with the nonprofit to deploy forty violence interrupters in Woodlawn, North Lawndale and Roseland. Judging from Cure Violence’s previous success, this partnership is a step in the right direction. I’m no expert in homicide prevention, but it seems like a logical next move would be for the city to draft a document, similar to CDOT’s transportation plans, laying out a holistic approach for lowering the murder rate to zero in the next decade. Strategies should involve all the departments that can address the root causes of violence: issues of housing, healthcare, child protection, addiction recovery, education, employment and more. It might also make sense to create a new city department dedicated to violence prevention, working in tandem with the police. Or perhaps the focus could be on allocating more resources to nonprofits and grassroots groups located within underserved neighborhoods, since these organizations know their communities best. Dangerous traffic is a universal concern, while street violence may seem irrelevant to those of us who live outside the affected neighborhoods. But in the long run it’s in everyone’s interest to solve our city’s homicide crisis. Perhaps with a new Zero-in-Ten strategy modeled after the one in CDOT’s transportation plans, we can finally arrive at a more just and peaceful Chicago. Bicycle Film Festival This annual fest showcases shorts and full-length movies about cycling and includes rides, parties, a bike-in brunch, sprint competitions, plus a block party with BBQ and BMX stunts. November 2-4, various locations. Opening-night screening Friday, November 2, 7 pm, at Chicago Cultural Center, 78 East Washington, bicyclefilmfestival.com; free. Tour of Uptown Learn about the history of this historic North Side neighborhood, once the stomping ground of Charlie Chaplin, Gloria Swanson and Al Capone, on this guided bike tour by architecture buff Lee Diamond. Saturday, November 3, Chase Park, 4701 North Ashland, (773)255-6347, chicagovelo.com, 11am-3pm; $10. Bridges & Blues benefit for the Cal-Sag Trail Join Friends of the Cal-Sag Trail for a party with bluesman Toronzo Cannon and beer from Argus Brewery to raise money to build the greenway along Chicago’s southern border. Saturday, November 3, 6pm-11pm, Moraine Valley Community College, 9000 West College Parkway, Palos Hills, (708)365-9365, bridgesandblues.org; $75. Southern Beauty ride The Pioneers bike club and Chicago Cycling club lead a tour of African-American landmarks on the South Side including the Monument to the Great Northern Migration, The Washington Cultural Center and the DuSable Museum. Sunday, November 4, 9:30am, Daley Plaza, 50 West Washington, (773)248-5499, tinyurl.com/southernbeauty; free. Play Streets in Chicago Lawn The Southwest Side community hosts one of the many Play Streets events being held throughout the city through November, block parties that provide children and adults with supervised spaces for sports, games and dancing. Monday, November 5, 5pm-8pm, Eberhart School, 3400 West 65th Place (312)427-3325, tinyurl.com/playstreetscl; free. South Side bike share public meeting Come learn about Chicago’s upcoming automated bike rental system with 4,000 vehicles and suggest locations for the roughly 400 docking stations. Wednesday, November 7, 6:30pm-8pm, Charles Hayes Center, 4859 South Wabash, tinyurl.com/chibikeshare; free.